I was lucky enough to go to the preview screening of episodes one and two from the second series of Girls last week, the very same night it aired on Sky Atlantic. Sky put on one hell of a bash at The Box in Soho, complete with sickly-sweet raspberry cocktails that were described as being ‘kind of like Vodka Collins’ but tasted more like strawberry Fruit Pastilles (yum). We sat, we waited, while delicious bites were brought out (too nice to let get away it seemed, as people scrambled across the room to eat more of them). Very nice parmesan crisp with beef tartare, if you ever need a steer. Ahead of the showing, we heard from Elaine Pyke, Director of Sky Atlantic HD. She gave us a rousing intro, pointing to Girls being one of the ‘most seminal comedy dramas of this decade, if not ever’ before Dunham herself appeared on screen with a message recorded just for us. We then settled down to watch, and I have to say, I wasn’t disappointed. Having all but devoured Season one in almost one sitting, we were lucky to have only had a four week gap in between the new series – largely because for the first time it was showing in the UK on the same day as the US. Just an awkwardly honest (as you’d expect from a Judd Apatow project), just as funny, with the main four characters displaying all of the same traits that made us love and relate to them. 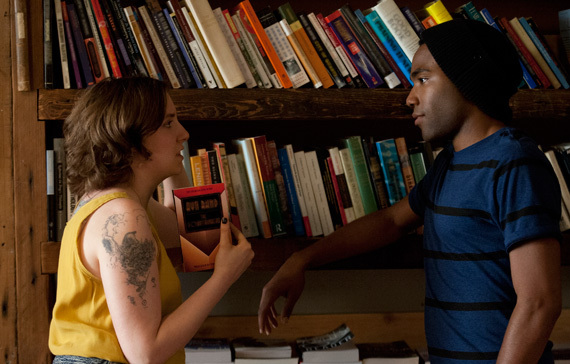 My only criticism is that while controversy around the lack of ethnic variety in the cast is answered by Dunham from the start, and the scenes between Hannah, her new bit (played by Donald Glover) and Elijah, are amusing – that storyline seems a little forced. But hey, give it time. I’m also a sucker for the INCREDIBLE soundtrack. They say music can destroy or lift film and TV to a higher level. Girls’ producers have done an amazing job, with Robyn’s ‘Dancing on my Own’ perfectly capturing the vibe of the series, and becoming an instant addition to every twenty-something women’s playlist everywhere (despite it being released two whole years earlier than the show). Check out the full tracklisting, it’s truly a great mix of electro, guitar and moody female vocal. Missed it? Catch up today before episode two tomorrow, showing on Sky Atlantic HD at 10pm.